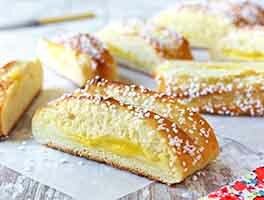 Light, airy, individual-size brioche are filled with vanilla pastry cream in this takeoff on a classic French dessert, Tarte Tropezienne. 7 hrs 30 mins. to 20 hrs 20 mins. In a stand mixer or bread machine (programmed for dough), mix together all of the dough ingredients to form a smooth, shiny dough. Don't worry; what starts out as a sticky mess becomes beautifully satiny as it kneads. This dough takes longer than most to develop, so be prepared to let the dough knead for up to 15 to 20 minutes in a stand mixer. Also, we don't recommend trying to knead it by hand. If you're using a bread machine, let it complete its kneading cycle, then continue as directed below. Form the dough into a ball (it'll be very soft), place it in a greased bowl, cover the bowl, and it let rise for 1 hour. Refrigerate the dough for several hours, or overnight. This will slow the fermentation and chill the butter, making the dough easier to shape. While the dough is chilling, prepare the pastry cream. In a medium-sized saucepan, stir together 2 1/2 cups of the milk, the sugar, and the salt. Bring to a simmer over medium heat, stirring to dissolve the sugar. Meanwhile, whisk the cornstarch, flour, and egg yolks with the remaining 1/2 cup milk. Whisk about 1/3 cup of the hot milk mixture with the egg yolks. This keeps the yolks from turning to scrambled eggs when you add them to the simmering milk. Pour the egg/milk mixture back into the remaining simmering milk. Doing this through a strainer will help prevent lumps later. Bring to a boil, stirring constantly with a whisk, until the mixture thickens. To avoid lumps, it's important to stir this constantly, and to run a spatula along the bottom of the pan to make sure nothing's sticking. Don't worry, the cream won't take long to thicken. Remove the pastry cream from the heat and pour it through a sieve to remove any lumps. Stir in the butter and vanilla extract. Transfer the pastry cream to a storage bowl, and top with a buttered piece of parchment or plastic wrap. This will prevent a skin from forming. Refrigerate the cream until you're ready to use it. 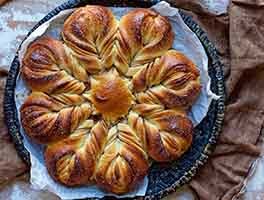 To shape and bake the brioche: Remove the brioche dough from the refrigerator, and divide it into 16 pieces. Shape each piece into a round ball. Space the balls on a lightly greased or parchment-lined baking sheet, leaving about 2" between them; they'll expand quite a bit. 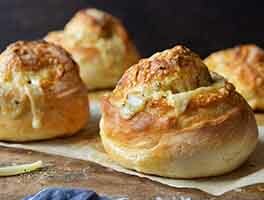 Cover the brioche, and let them rise for 2 1/2 to 3 hours, until they're very puffy. Towards the end of the rising time, preheat the oven to 375°F. 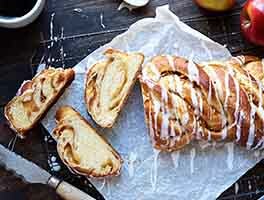 Brush each brioche with some of the egg wash, and sprinkle with coarse white sparkling sugar or Swedish pearl sugar. Place the pan on a lower-middle rack in the oven, and bake the brioche for 25 to 30 minutes, tenting them with aluminum foil after 15 minutes if they appear to be browning too quickly. The finished brioche will register at least 190°F on an instant-read thermometer inserted into the center. Remove the brioche from the oven, and cool on a rack. Finish the pastry cream by whipping the 1/2 cup heavy cream to soft peaks, and folding it into the refrigerated pastry cream. Slit each brioche around the circumference, making a top and bottom. Spoon a heaping 1/4 cup filling onto the bottom, and lay the top over the filling. Serve within an hour or so. Brioche can be filled and refrigerated for several hours, covered. Allow them to warm a bit before serving. To make just 8 filled brioche, make the entire brioche recipe, reserving half the brioche for sandwiches or dinner rolls. Make just half the pastry cream recipe, and fill 8 brioche. Turned out well overall and my family is pleased. My one disappointment was the bottoms - not the tops - burned. How is that preventable? I put them on parchment paper in the lower part of the oven. Otherwise everything went exactly as the recipe said. The brioche were very good, bigger than I expected, about 4 inches across and almost as high. (However, as I posted separately, the dough mixture was so heavy it broke my bread machine; a Zo might handle it but not a less expensive single blade bread maker). The pastry cream looked and tasted great and was nice and thick before I added the whipped cream, then became a little more runny than I would like, so next time I think I will leave it out. I'm keeping the cream in the fridge and filling the brioche as we eat them so they don't get soggy. Very tasty! These were a big splurge in calories and fat, and I hoped they would taste as awesome as the seemed to have the potential to be, as a special treat for my family. The cream filling is great tasting (although full of calories) but the brioche was disappointing. The brioche tasted almost like a slightly sweet hamburger bun, and had that texture as well. They were not light and flaky. The filling squirted out the back when we bit into the bun, very messy. This recipe is not worth the fat and calories. I threw most of it away. I am sorry to hear of your difficulty. 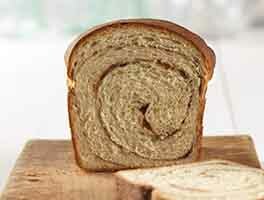 From your description it sounds like the brioche dough was not fully developed. 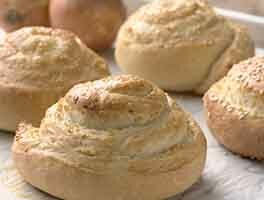 For a rich dough like this to be light and airy, the gluten needs to be fully developed and the bun fully baked. See steps #1 & 15 for more details. Frank @ KAF.